Recently I made my first batch of homemade Limoncello. Limoncello is an Italian liquor made with grain alcohol or 100 proof vodka infused with lemon zest and sweetened with a sugar syrup. It is best when served well chilled and can be an aperitif or dessert liquor. 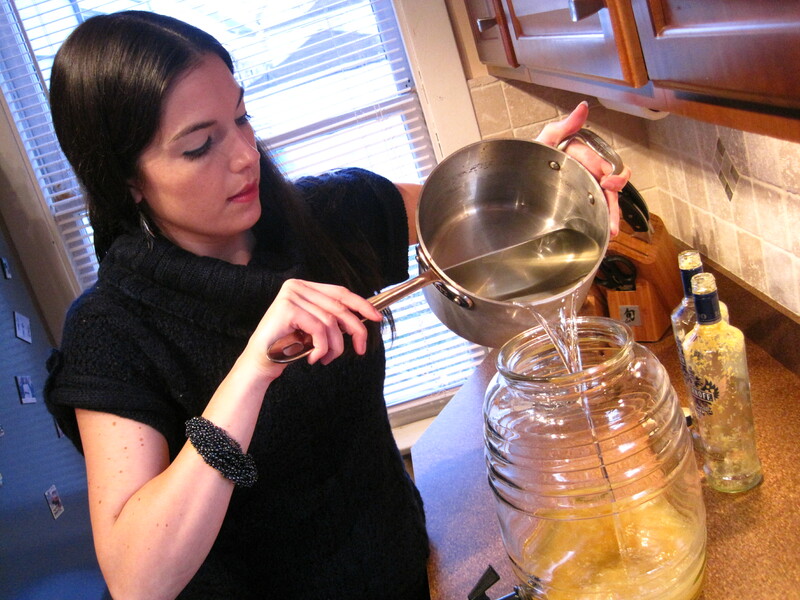 In a previous blog post , Limoncello Experiment – Step 1, I described the first step of zesting the organic lemons and adding them to the 100 proof vodka. I then let the mixture infuse for 45 days. The hardest part of the wait was the first week. Look at the beautiful golden color! 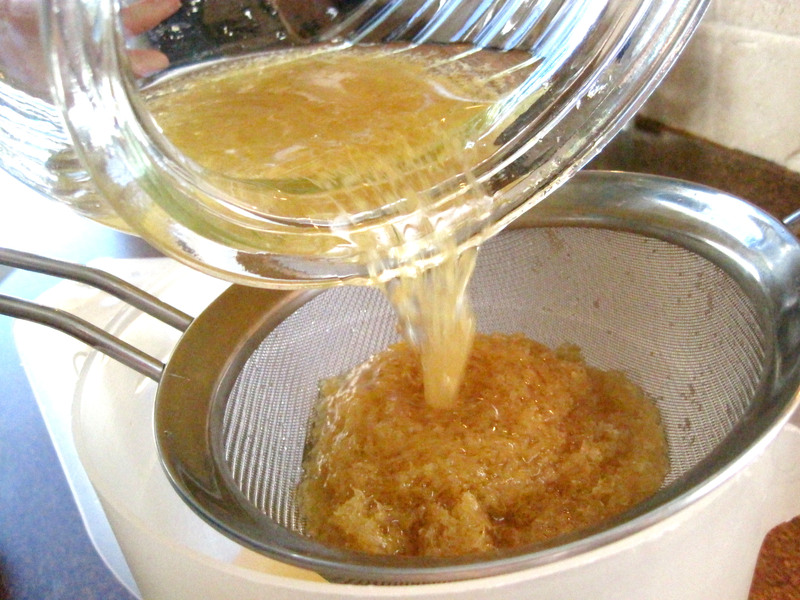 The next step was to make the sugar syrup. I stirred 3 1/2 cups of white sugar into 5 cups of filtered water in a large pot and brought it to a simmer on the stovetop. I sent my Chicago tap water through a Brita filter, but you could also buy bottled water – the cleaner the flavor, the better. I had found a large glass beverage dispenser at a discount store. 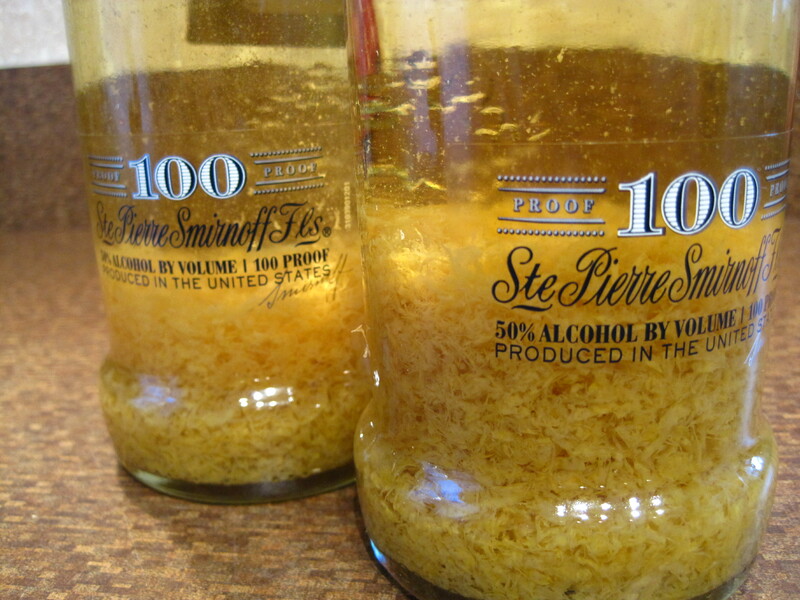 I mixed the sugar syrup and the two bottles of vodka and zest together into the jar. The lid did not come with a rubber gasket, so I devised my own seal with multiple layers of plastic wrap and a rubber band. Then I put the jar back on the shelf to sit for another long 45 days. After the second round of infusing was done, I had to strain the lemon zest out of the liquid. It helps to have a large pitcher available for this task so that you have two large containers to pour the liquid between. I poured the mixture through a wire mesh strainer twice and then lined the strainer with a paper towel (you could also use a coffee filter) and strained the liquid again. The more times it is strained, the clearer the Limoncello will be. Finally, after 90 days of infusing, the Limoncello was ready! The Limoncello tasted fresh and sweet with a very lemony aroma, like home-made lemon curd for lemon meringue pie. When tasted side by side with a store-bought brand, it was apparent that the store-bought one tasted like powdered lemonaid drink mixes with a very strong alcohol aroma. After all, it was decided that the 90 wait and the extra effort is worth it when you get to enjoy a sip of home-made Limoncello after dinner. Here is the recipe again. 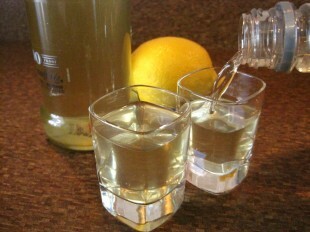 For a good guide and lots of useful information about Limoncello, check out www.LimoncelloQuest.com.